“Who is your sponsor?” is a question that some women hear, when they come to VA for an appointment. Although VA has come a long way in recognizing the military service of women, this question still rears its head far too often. VA is committed to a culture change to ensure that women Veterans receive the same recognition, dignity and respect as male Veterans. As part of this broader effort, VA’s Veterans Experience Office partnered with the School of Visual Arts (SVA) in New York to tackle the ongoing challenge of promoting more equitable access for women Veterans and recognizing the military service of women who come to VA. SVA trains its students to use design to solve problems and they chose to focus specifically on Veterans for their research project. 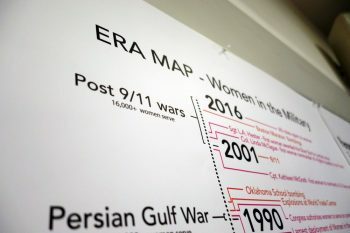 The goal of the partnership was to assist VA in employing design thinking and research techniques to create tangible solutions to real problems that women Veterans encounter when accessing benefits and service – while the students learned about how design can make a difference. When students from SVA’s fall semester Design Research and Integration class learned that women Veterans are often assumed to be dependents of a male Veteran, they narrowed their research scope from examining the challenges of all Veterans to focusing on women Veterans specifically. Hearing that women Veterans are often mistaken for being the spouse of a male Veteran made the design students realize there was a lot of work to be done to help flip this perception: When asked to imagine (or even Google) a Veteran, how many of us ever think of a woman? It was the answer to that question that made us realize that this topic needed attention, and with the help of the VA Women’s Clinic in (Manhattan) New York, we would have a real-world setting to research and design for. To better understand the unique or disproportionate challenges women Veterans face, the class focused on: how to help women be seen as Veterans; improving female “no show” rates for scheduled appointments; and increasing women Veteran’s engagement with VA services. Using information from first-hand accounts of women Veterans utilizing VA services, staff that provide services to women Veterans, and the general public, the team collaborated with VA to develop strategies to meet the challenges impacting women Veterans. One student team developed a design idea for a #SheServed campaign to change cultural norms; and another conceptualized an innovative mentorship program for women Veterans – check out the links to see their work! 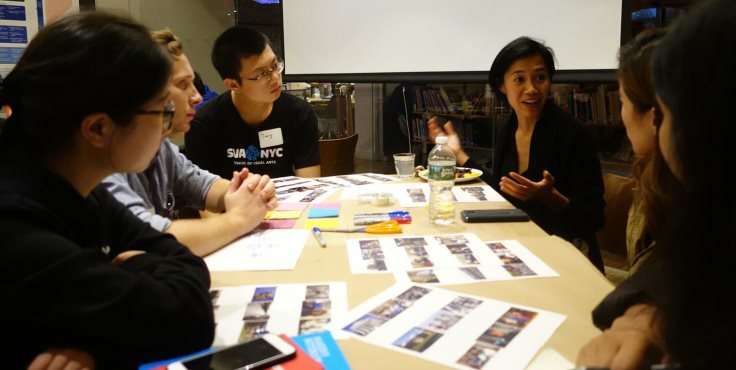 SVA’s Master of Fine Arts in Products of Design is a two-year graduate program that prepares design leaders to be more focused with the “consequences” of design—using design as a process for solving problems in an ever-more complex world. Students learn systems design, service design, graphic design, and industrial design in the program, as well as a lot of studies in business principles, policy, politics, and storytelling—all aimed at creating the new types of value that catalyze positive change. Many thanks to students Andrew Schlesinger, Alexia Cohen, Will Crum, Smruti Adya, Bernice Wong, along with instructor Lawrence Abrahamson and department chair Allan Chochinov for their input! About the author: Shannon L. Middleton, is a program analyst at the VA’s Center for Women Veterans. She also served as an intelligence specialist in the U.S. Navy.